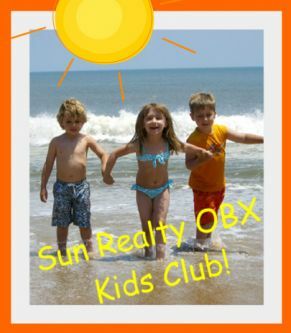 Kids Rule on the OBX! Yay! Your Outer Banks vacation is almost here! Now is the time to make plans for the coolest beach vacation ever! We've got a list of awesome kid-friendly Outer Banks activities for your family to check out - no boring stuff allowed. There are so many fun things to do on your Outer Banks vacation - go boogie boarding, see sharks at the aquarium, climb a giant sand dune, reel in a big fish, explore a lighthouse, and much more! Ahoy Matey! Did you know that the Outer Banks of North Carolina used to be a favorite spot for pirates? Before you come on your Outer Banks vacation, learn about Blackbeard and his ship, Queen Anne's Revenge . We teach you how to speak like a true swashbucklin' pirate, tell you what a Jolly Roger is, and basically give you the ins and outs of pirate life. Check out creepy and cool facts about Outer Banks pirates and ghosts ! We also have stuff for your parents - tips for making the car ride to the beach more fun, books and DVDs about the beach, craft project ideas, and more!